Since the turn of the millennium, there has been a reoccurring problem in Hip Hop that has stifled many a rapper’s career. Initially passed off as anomalies, there is now a long list of hotly tipped prodigies who have dropped off major label rosters and plunged into the depths of obscurity (only to be washed up months later, still bitterly ranting on their own message boards). The fall out follows a predictable pattern - the artist spends the remainder of their short lived career releasing series after series of largely unsuccessful mixtapes that are used as a platform to moan about misguided marketing plans and nonexistent funding. The label on the other hand have no trouble finding a replacement as thousands wait in line and quicker than you can say ‘unsigned hype’ the cycle is started again. So how does this bring us to Slaughterhouse then? Well, take 4 very different rappers, each with a unique style, each with a considerable underground following and each with well recognised talent behind the microphone. Throw in some top quality beats from a selective pool of highly regarded producers and release it on an independent that is willing to be accountable yet flexible with deadlines, release dates and sales figures. But most importantly, make sure that those 4 rappers each have very different but equally significant major label altercation stories. 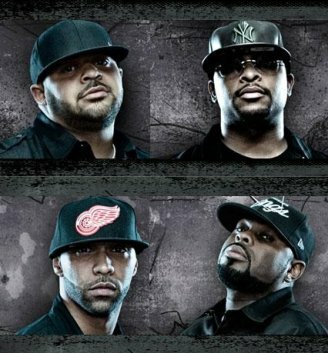 Because as much as the members of Slaughterhouse want us to ‘move on’ from their speculative previous interactions with the music industry, not only does it provide a talking point, it also gives us added reason to root for the over talented under dogs. Not to mention the fierce sense of injustice and competition that comes across in each rappers tone and delivery. So what exactly are their stories? Well, without labouring the point… Crooked I’s murky past includes a long and unfruitful stint on Suge Knight’s Death Row Records, surrounded by controversy and confusion as to whether he has completely severed contractual obligations to the company. After the commercial might of Joe Budden’s 2003 summer smash ‘Pump It Up’ propelled the success of his debut album, record label Def Jam publicly fumbled the follow up which ultimately lead to a drawn out parting of ways and an equally shambolic period on Jay Z’s Roc-A-fella Records. Joell Ortiz was dubbed the next big thing in late 2006 when he signed with Dr Dre’s Aftermath Records but after bizarre legal agreement meant that Kotch had the rights to release some of his older material, enthusiasm waned and he was dropped last year. Detroit raised Royce da 5’9” is the most established of the bunch, however feuding with Eminem’s right hand man Proof early on in his career has remarkably overshadowed a number of highly respectable albums that still don’t receive the recognition that they deserve. All still chasing the seal approval, the four first came together last year when handpicked by Joe Budden for a track on his digitally released album Halfway House. It wasn’t long before people started to talk and rumours of further work together started to circulate, as much as a request as an expectation. Ever hungry to live up to the demand, the group wasted no time leaking a series of tracks online which cemented their intent to continue working together on future projects. August 11th 2009 saw the release of the first official long player, including all 4 rappers as key elements in the structure and vocal contribution to each song. Allegedly written and recorded in just a 6 day period, it’s clear that the members of Slaughterhouse are all too familiar with how quickly the attention of the world can move on if not acted upon. So with the promise of a follow up already in the pipeline, the group are currently on a break while they each sort out their own solo projects before coming together again for another collectively recorded effort at some point next year. In the meantime, the group featured on the bill for this years Rock The Bells tour adding another arrow to their already impressive bow (the tour saw the group take their live show to 11 different venues across America). As well as this, the summer also lay host to a smattering of other live appearances stateside, further helping to bolster the image of a group as having considerable intent.